I have downloaded human chromosome's data from UCSC FTP. Some part is in small alphabets and some is in large alphabets. Does it show the coding and non-coding region? What is the difference between upper and lower case in nucleotide fasta sequences? What are the repeating N characters denoting? hg38.2bit - contains the complete human/hg38 genome sequence in the 2bit file format. Repeats from RepeatMasker and Tandem Repeats Finder (with period of 12 or less) are shown in lower case; non-repeating sequence is shown in upper case. hg38.fa.gz - "Soft-masked" assembly sequence in one file. Repeats from RepeatMasker and Tandem Repeats Finder (with period of 12 or less) are shown in lower case; non-repeating sequence is shown in upper case. hg38.fa.masked.gz - "Hard-masked" assembly sequence in one file. Repeats are masked by capital Ns; non-repeating sequence is shown in upper case. It would appear that the number of Ns corresponds to the number (perhaps an estimate) of bases the identity of which are not known. This is suggested by the following on the general downloads FAQ page at https://genome.ucsc.edu/FAQ/FAQdownloads.html. Question: "When I download human chr22 from your web site, the unzipped file contains only N's." Response: There is a large block of N's at the beginning and end of chr22. Search for an A to bypass the initial group of N's. 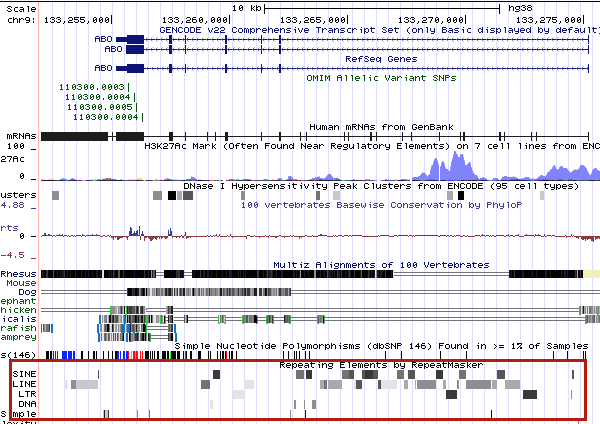 If you download the human chromosome data from GenBank you will not find the lower-case characters (i.e. they are not a standard feature). The reason they are in the UCSC files is because these files are the ones used within their Genome Browser, which displays these repeats, as illustrated below. Lowercase letters indicate repeat-masked regions. N's represent gaps. Sequence in caps are usually regions of interest, such as exons. 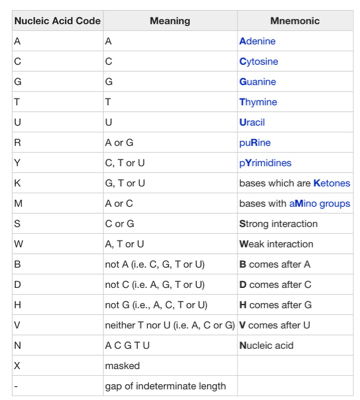 N in the DNA alphabet refers to "unknown nucleotide" It can refer to any of A/T/C/G when the actual underlying base is unknown. How does one find the corresponding SNPs in the pair of chromonosmes in a FASTA file?